This recoil buffer is a replacement bolt stop pin for the Ruger 10/22 and 10/22 .22Mag rifles. The Volquartsen Recoil Buffer will greatly reduce the hammering effect of metal-to-metal contact of the bolt against the receiver thus extending the life of the receiver. 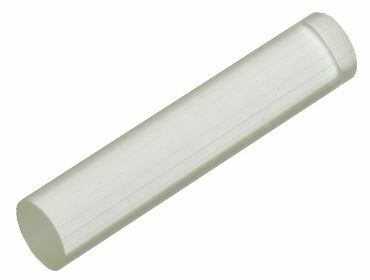 The recoil buffer is made of a clear urethane. This is the same buffer that is used in all of the Volquartsen 10/22 .22LR rifles. Note: This buffer cannot be used in Volquartsen 10/22 rifles in .22 Magnum or .17 HMR calibers. Not necessarily what I would consider a "must-have" item, but all the same it definitely helps to reduce metal-on-metal contact within the receiver, which is always good. The bolt doesn't make as much noise when the action cycles any more. Now, after you have put all thoses upgrades in your 10/22 dont forget the bolt buffer, cheap way to protect this fine rifle and to stop recoil shock to your bolt and optics it removes the vibration shot after shot and help keep your groups tighter! If you have invested in the accuracy of your rifle dont foget this last part and it dont break the bank. its great.....it reduced the recoil of my rifle greatly with the addition of the target hammer kit! A must if you use suppressor on you 1022. This little item is very nice. Removes the 'clack' when firing the weapon. Easy install, great price, and piece of mind. Great addition to my 10/22. It keeps things a lot quieter & takes the metal to metal clang out of the recoil. Glad I bought it. Rimfiresports does it again, great service! not a very noticeable difference, but it does give peace of mind that you're not having that metal to metal contact. Wedges into place, sometimes a little too well, especially when I want to pull the bolt for cleaning. Works great, though! Softens the recoil and keeps me on target! This one has a heaver steel pin than the others so I'm expecting it to last a lot longer than the others I've used before. Reduce the recoil and the hammer effect of the bolt, it gives a more silent operation too, get one !